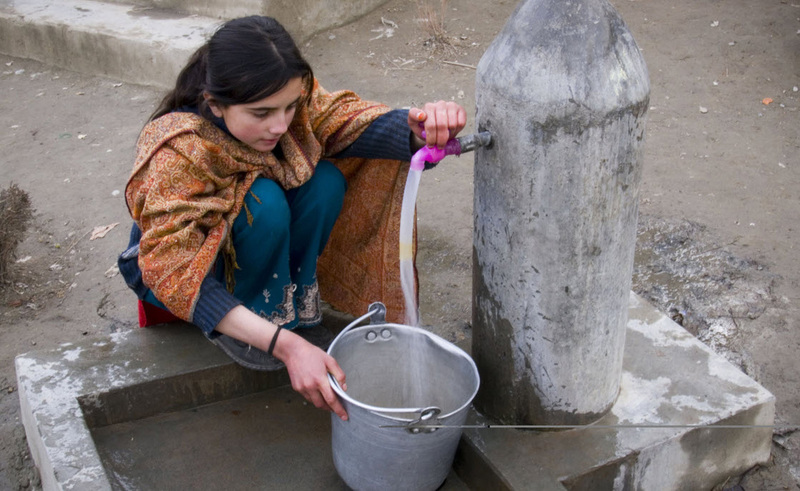 Islamabad, Pakistan, 28 January, 2015 – In an area where half the population did not have access to safe drinking water and adequate sanitation facilities, a four-year project to improve safe drinking water and sanitation facilities has benefited over 200,000 people in 12,000 households in the Gilgit-Baltistan and Chitral (GBC) regions of Pakistan. The project is a public-private partnership between the German Government, the Aga Khan Development Network (AKDN), the Government of Gilgit-Baltistan (GoGB), the Government of Khyber-Pakhtunkhwa and local communities. As part of the German government’s grant (through KfW) of €9.4 million (PKR 1.25 billion), announced in 2010, safe drinking water, sanitation and sewerage facilities were provided in northern Pakistan through the implementation of the Water and Sanitation Extension Programme (WASEP), one of Aga Khan Planning and Building Service’s award-winning, flagship programmes. The project included provision of potable water to people in over 12,000 homes, installation of 10,000 latrines and more than 12,000 household tap stands, as well as 500 communal taps. Three large integrated area upgrade projects were constructed in Aliabad- Hunza; trainings were conducted for over 500 members of the Water and Sanitation Committees that manage the Operations and Maintenance of WASEP schemes. Mr. Wolfgang Moellers, KfW Country Director, emphasized the role of WASEP in promoting peace and harmony amongst the communities by mediating the sharing of water resources. “Life in far flung areas is difficult. We appreciate the combined efforts of the concerned government departments of Khyber Pakhtunkhwa and Gilgit-Baltistan and AKDN in addressing the local development issues with effective public participation. This synergistic approach is the reason why Germany has supported AKDN over the last 20 years,” said Moellers. “With the application of sustainable and risk resilient technical interventions, we have been able to improve the quality of lives, particularly of women and young girls, who used to spend a large part of their day collecting water from contaminated sources located far away from their villages,” Hafiz Sherali, Chairman AKPBSP said. He added that the health indicators for people in GBC had significantly improved because WASEP schemes ensure that the quality standards of drinking water are as prescribed by the World Health Organization. Prior to these schemes, the villagers had no access to reliable supply of safe drinking water in the area. Nearly half the population in GBC does not have access to safe drinking water and adequate sanitation facilities. Many households have no option but to collect water from open, contaminated channels thus falling victim to water-borne diseases. During harsh winters, women and children suffer the most as they are the principal collectors and bearers of water, and have to travel long distances to collect water for drinking, washing and cleaning. According to pre-intervention indicators in the region, 30 to 40 percent of all deaths were attributed to water borne diseases; women and young girls spent on average three to four hours per day travelling long distances to collect contaminated water; and on average 30 percent (PKR 3,700) of a household’s income was spent on medical expenses related to waterborne diseases. “My daughters would suffer terribly due to diarrhoea from drinking dirty water from the un-cemented well,” said Tasleem Bano, a resident of Khanabad, Lower Hunza. She said that at least Rs. 500 out of her husband’s monthly earnings of Rs. 6,000 would be spent on medical treatment for her children. “We have been saved from the curse of diarrhoeal diseases, and I no longer have to spend time and energy hauling water uphill from the well. I can use the additional time to help my children with their homework or stitch nice clothes for them – a luxury I couldn’t afford before we were blessed with WASEP. We are even saving for constructing a house!” she said. Other post-intervention achievements include: improved hygiene practices such as hand washing, as well as latrine usage at the household level; village to village dialogue for the purpose of reducing water dispute issues; and, water and sanitation awareness and education outreach through more than 1500 School Health Improvement Programmes (SHIP) and 1300 Community Health Improvement Programmes (CHIP). Aga Khan Planning and Building Services’ Water and Sanitation Extension Programme (WASEP) has benefitted more than 350,000 people in Gilgit-Baltistan and Chitral by providing them access to safe water and sanitation facilities. The projects have had positive impacts on health, education (improved school attendance), economic development (reduced time burden on women collecting water to instead engage in recreational/income generating activities), and gender empowerment (women are given a central role in all projects to raise awareness with regards to health and hygiene practices). The interventions also promote behavioural change, reduce burdens on income resulting from expenditures on health, and reduce burdens on women and children of collecting water from distant sources.